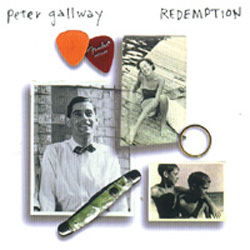 Gadfly Records is proud to announce the release of "Redemption," an all-new studio album from Peter Gallway, one of New York's most respected singer/songwriter/producers. From his early major-label albums with the Fifth Avenue Band to his more recent solo albums, Gallway has created a body of work that has won him long-term fans who know they can always expect something good from his jazzy urban-soul-folk. Most recently Peter has received extensive praise and attention for his role as production coordinator for the well-received "Bleecker Street" CD released earlier this year. Born and raised in New York City, Gallway cut his musical teeth at a time which fostered the talents of the Lovin’ Spoonful, James Taylor, Richie Havens and Laura Nyro, to name but a few. Recording just out of high school with his group the Strangers, he eventually made three albums for the Warner/Reprise label, the first of which was with the highly acclaimed Fifth Avenue Band. His following two solo outings lead to extensive touring across the United States and Japan. After spending the first half of the seventies in Los Angeles, Peter landed in Maine where he based his touring band, honed his recording skills, continued to write and eventually to produce projects for other artists. 1978 and 1979 saw the releases of “On The Bandstand” for the Vividsound label of Tokyo and "Tokyo To Kokomo," an Imagination/Rounder release in the United States. The early '80s brought increased popularity of his band, tours of Japan, "Sunday Basketball" featured in the film "Hoopla" for the Basketball Hall Of Fame, Best Songwriter at the Maine Music Awards, collaborations on three works of musical theater through the Maine Festival Of The Arts and Portland Stage Company by way of The National Endowment. His sixth album "Proof" was released through Fishtraks in 1985. A second Fifth Avenue Band collection was recorded in 1990 and released to great acclaim on the giant Pony Canyon label of Tokyo. Meanwhile his list of production credits was growing to include multiple projects with Devonsquare, Aztec Two-Step, Cormac McCarthy, Tom Pirozzoli and more. In 1988 he moved back to New York City and worked with Cliff Eberhardt, Christine Lavin, Japan’s Bread and Butter and Hawaii’s Kalapana. Greater involvement with recording companies led to an A&R consultancy with Shanachie Entertainment. Meanwhile he produced and recorded another acclaimed collection of his own music entitled, "Small Good Thing," released through the Gadfly label in 1994, and followed that up with "Yes Yes Yes" (Gadfly, 1996), and then the live album "A Night In Time" (Gadfly, 1997). Recent projects include the above-mentioned Bleecker Street CD, Jim Infantino Live, Jabbering Trout, Devonsquare, and The Music Of Laura Nyro featuring Jane Siberry, Suzanne Vega, Jill Sobule and Patty Larkin, among others. Called "a master of free verse" in the Boston Globe, and "a star in the making" in the New York Post, Peter’s ever-growing body of work stands as testament. He lives in Greenwich Village.